Chimamanda Ngozi Adichie, Americanah, Alfred A. Knopf, 2013, 477 pp. This book defies category. It is an epic novel, across continents and decades. It is a political commentary, full of astute observations and cultural critique, especially around issues of race and immigration. It is a good story, beautifully written, compelling and challenging. The quality of the writing and fiction are not diminished by the insertion of straight cultural commentary, nor does the narrative serve to lighten the impact of the author’s searing observations. It is masterful, and an important read both as a novel and cultural critique. All the better: it’s a great story, a love story. Chimamanda Ngozi Adichie has written a book that shows us all the power of the novel as a genre, the way an extended perspective and intimate connection with a character can create new forms of empathy, understanding and a window on the human condition. The two at the center of the story are Ifemelu and Obinze. They seem destined for one another, made perfectly suited to match one another’s wits and habits, and they fall in love while in secondary school in Nigeria. Adichie tells the story of their individual upbringings and their school years against the backdrop of military uprisings in Nigeria. After graduation, Ifemelu departs to study in the United States. Her experience of immigration changes her, and she separates from Obinze, a heartbreak to them both. The novel explores how, and if, their relationship can be recovered. Obinze may have stayed in Nigeria, but he has changed as well. Will their love persist? Can it? Should it? This is no starry-eyed romance. This is a real and deep exploration about what it means to love, to grow with another imperfect human being, and the power of conflicting commitments. One of the central themes is the question of home and exile. 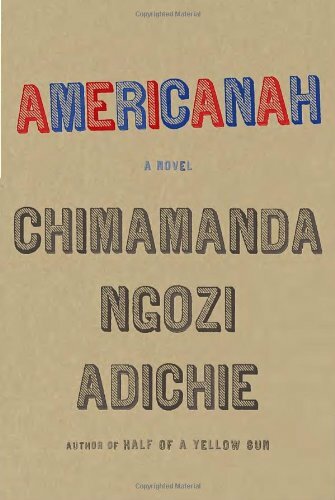 To be an “Americanah” is to be a Nigerian that has spent so much time abroad that they no longer fit well in Nigeria. The novel is set after Ifemelu has spent 15 years in the U.S. before deciding to move back, and she wonders if she will be able to readjust. One of the key experiences is Ifemelu’s introduction to the American concept of race, and the necessity for her to learn how to navigate the unspoken, subtle and not-so-subtle privilege and discrimination that attend it. She eventually begins to write a blog about it, entitled, “Raceteenth or Various Observations about American Blacks (Those Formerly Known as Negroes) by a Non-American Black.” The novel contains several complete blog entries, but those are not the only sources of cultural critique. The story itself navigates Ifemelu’s difficult relationships with American men, both black and white, as she learns the social cues and racial dynamics. The novel is peppered with these observations, and they are powerful. The italics are original, but I love that line. Of course, Americanah is just that kind of work of literary fiction. I hope people pay attention. 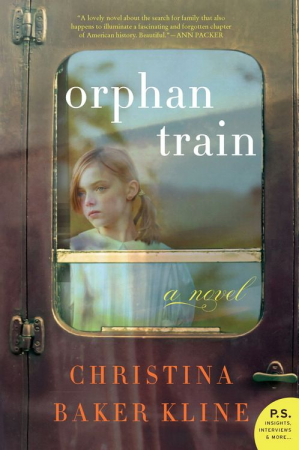 Orphan Train by Christina Baker Kline, William Morrow of HarperCollins, 2013, 278 pp. After pushing through the last seven books on Jesus, orthodoxy and theology for work, I was in desperate need of a good novel. I discovered I was more desperate than I realized–or at least this novel was better than I anticipated. I sat down to read it at 9:00 p.m. on a Monday night, and never closed it until it was finished. Orphan Train is the fictionalized account of a young girl, Molly, at the end of her journey through the foster care system after having lost her parents, and Vivian Daly, an orphan with an heartbreaking tale of her own. Vivian Daly was a child of the “orphan trains,” which ran from major East Coast cities into the Midwest, sending children out to be adopted by families across the country. The novel unfolds the story of Vivian’s extraordinary journey, which began in Ireland, continued through Ellis Island into a New York tenement, collapsed with the loss of her family in a fire, and then sent her on a train to unknown places in the Midwest. Even once she reached her destination, she still moved through several homes. Vivian’s childhood was brutal and unkind, as she was treated more as hired help than as anyone’s child, but her story is one of hope and triumph. Parallel to Vivian’s story, the author gives us the redemption of Molly Ayer, whose own betrayal by the foster system has brought her close to juvenile hall. Befriending Vivian Daly is part of her community service, but they discover a connection to the harsh reality of growing up with no one who loves you or calls you “family.” Together, they trace their stories, find kinship, and help one another move into a surprising and beautiful future. I read this too fast to set aside beautiful passages, but it’s the story that makes this most compelling. The characters are engaging and the history and plot are absolutely fascinating. It’s a joy to read. 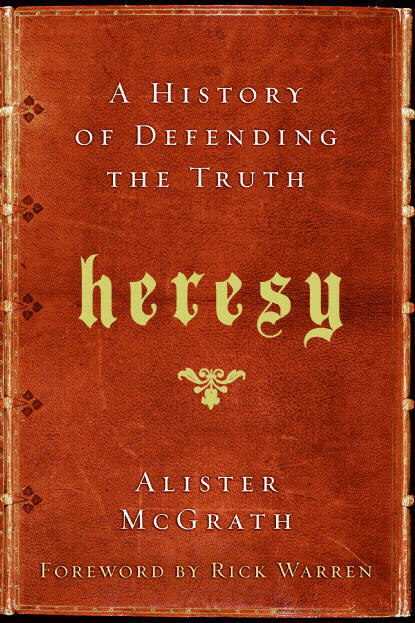 Heresy: A History of Defending the Truth by Alister McGrath, HarperOne, 2009, 282 pp. This follows a series of five book reviews on the Christian creeds, which I read in preparation for a sermon series entitled, “I Believe: Christian Creeds in Context.” Those sermons can be found here. Alongside reading five books and preparing six sermons on the Christian creeds, I had to read up on the controversies that sparked many of the creedal formulations—the debates among early followers of Jesus trying to sort out the basic beliefs required to remain within the Christian fold, tracking the groups labeled “orthodox” against the groups labeled “heretics.” It was one of the most interesting and helpful things I read. Having been influenced by Bauer’s ideas about heresy and subject to the intrigue McGrath criticizes, I found his position compelling. Orthodoxy, he argues, is not about exercising power over one’s detractors—it is about protecting Christianity from easy answers and demystification. He uses the metaphor of dead ends. Heresies are theologies that do not lead anywhere, that result in pat conclusions and a God that can too easily be known and understood. This angle made a progressive, mystic Christian like me sit up and take notice. McGrath continues this line of thinking in his chapter on “The Early Development of Heresy,” where he argues that innovation is required for orthodoxy. It is heresy that wishes to limit or calcify Christian doctrine. He traces this theological claim back to Athanasius in the third century, and follows its progress through a series of orthodox theologians who all emphasize the need for Christianity to evolve. This accords easily with our United Church of Christ Constitution, which “claims as its own the faith of the historic Church expressed in the ancient creeds and …affirms the responsibility of the Church in each generation to make this faith its own.” However, I did not expect this to be defined as the practice of orthodoxy for all Christians. It raises serious questions for contemporary fundamentalist traditions that demand an unchanging, unquestioning faith. The remainder of the book offers a deeper look into several prominent heresies, including Ebionitism, Docetism, Valentinism, Arianism, Donatism, and Pelagianism. Other heresies, such as Montanism and Marcionism, make brief appearances from time to time. McGrath does not offer an exhaustive catalog of heretical thought, but takes representative examples. One of the most interesting things I had not previously recognized was the extent to which heresies are more, rather than less, morally demanding and restrictive than orthodoxy. The Donatists are a chief example, but I am also reminded of movements such as the Shakers. I found McGrath’s defense of orthodoxy very compelling, because it offers a breathable, evolving faith that preserves mysteries rather than forcing them closed. It offered me a much different approach to the historic creeds of the church that unlocked them in new and compelling ways, and engaged my often-skeptical faith in a richer conversation with orthodox ideas. 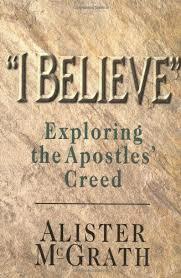 “I Believe” Exploring the Apostles’ Creed by Alister McGrath, InterVarsity Press, 1997, 120 pp. This is the fifth of five book reviews on the Christian creeds (and a book in heresy), which I read in preparation for a sermon series entitled, “I Believe: Christian Creeds in Context.” Those sermons can be found here. Alister McGrath is a darling of the evangelical movement, because he is a Christian apologist willing to argue with leaders of the New Atheism movement with the authority of his academic credentials at Oxford. He is generally a conservative sort, but I enjoyed his books on the development of the King James Version of the Bible and his biography of John Calvin. This book on the creed was not as uniformly helpful as some of the other resources, simply because other resources (including his own book on heresy) covered the topics with greater depth and interest. 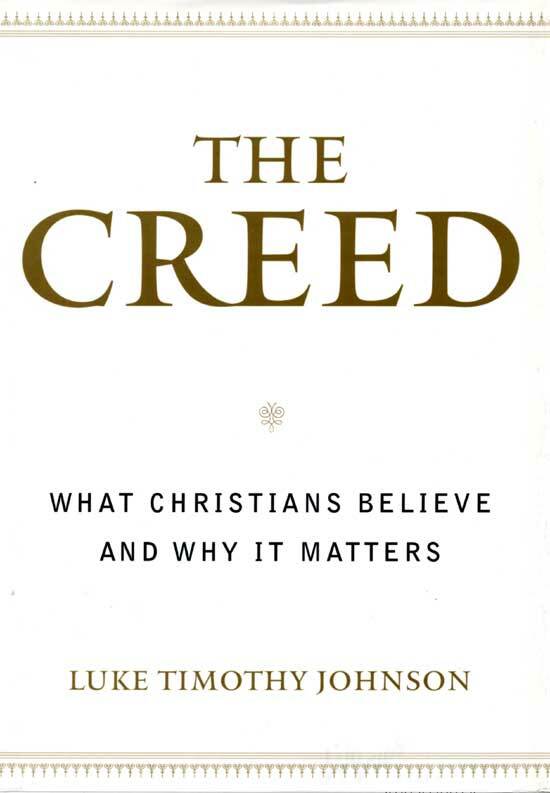 McGrath’s take on the creed divides it into six sections, each of which gets a chapter in the book. Each chapter begins with a segment on “The Ideas Explained,” followed by a parallel on “The Ideas Applied.” He emphasizes the scriptural background of each section of the creed, providing a list of biblical citations at the end of each chapter, without commentary. His best contribution to the conversation about the creeds was his logical, critical analysis of each element of the creedal theology. McGrath was most helpful for his ability to be clear and concise in his descriptions, but the brevity of this work leads to few new insights or ideas. However, I was simultaneously reading his book on heresy, which covered much of the same territory in a richer and more interesting way. 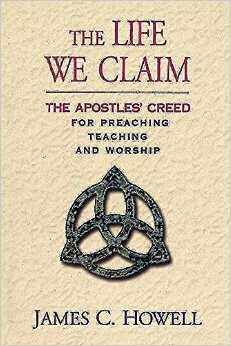 The Life We Claim: The Apostles’ Creed for Preaching, Teaching and Worship by James C. Howell, Abingdon Press, 2005, 173 pp. This is the fourth of five book reviews on the Christian creeds (and a book in heresy), which I read in preparation for a sermon series entitled, “I Believe: Christian Creeds in Context.” Those sermons can be found here. James C. Howell wrote the excellent commentary about the creeds for the Narrative Lectionary series that inspired me to preach my sermon series on the topic, so his book was among the first I sought. The Life We Claim lives up to its subtitle as a resource for preaching, teaching and worship. The book is structured in 35 short “lessons,” which includes both a line-by-line breakdown of the Creed and introductory materials. Each small group of lessons is followed by a sample sermon on that section, 14 total. The appendix even includes suggested hymns, songs and anthems to accompany a related sermon series. The most helpful part of Howell’s book, for me, were the sample sermons. I struggled to find ways to preach on the components of the Apostles’ Creed that was more than theological instruction. Howell’s contribution was to move beyond teaching into preaching, a way of telling the good news and challenge in each section of the creed. He offered ways to see the lines of the creed as an invitation to spiritual connection in daily life, including many helpful illustrations and metaphors. For example, his sermon on God as Father imagined God’s experience of fatherhood based on his own. He describes his experience of fatherhood, then imagines God’s. Later, his discussion of Jesus’ suffering on the cross urges us into places of suffering in God’s name. One of the most controversial lines in the Apostles’ Creed is about Jesus’ “descent into hell.” Howell’s succinct argument was the most persuasive and accessible of any of the authors I read. Howell writes with a pastoral heart. This book offers just what it promises–tools for teaching, preaching and worship focused on the Apostles’ Creed. I recommend it highly for that purpose. In Search of Belief by Joan Chittister, Liguori/Triumph, 1999, 217 pp. This is the third of five book reviews on the Christian creeds (and a book in heresy), which I read in preparation for a sermon series entitled, “I Believe: Christian Creeds in Context.” Those sermons can be found here. Joan Chittister is in a category all her own. While everyone else approaches the creeds with an attempt to explain or expound, to offer background or argument or enhancement, Chittister approaches the creeds with her self, her questions, her wonderings, and her mysticism. What emerges is a spiritual conversation–sometimes argumentative, sometimes comfortable–musing on the Apostles’ Creed. Her spiritual paths invite a depth and richness in our contemplation of the creed, word by word, that cannot be hurried but must be pondered. As the creed unfolds, Chittister’s Roman Catholicism and feminism show through boldly in the chapters on Mary and the church, which offer searing critiques of the Roman church’s refusal to ordain women, denial of feminine language of God and closed-minded teaches on sexuality. I also found her Catholicism evident in the chapter on judgment, which included a wonderful insight into “healthy guilt,” which she identifies as a guilt that is felt for the right things (like ways we harm others), is not exaggerated, and can be acted upon to change our behavior and situation. There are lots of jokes about Catholic guilt, but this is an insightful understanding of the purpose of this emotion. As always, Joan Chittister goes deep and invites us to engage not just in the work of thinking, but of connecting and living in a relationship with Christ, in this embodied world and in the realm of the heart. This book was well worth a slower, more dedicated read than I gave it. There is much beauty and wisdom contained in it. The Creed: What Christians Believe and Why It Matters by Luke Timothy Johnson, Doubleday, 2003, 325 pp. This is the second of five book reviews on the Christian creeds (and a book in heresy), which I read in preparation for a sermon series entitled, “I Believe: Christian Creeds in Context.” Those sermons can be found here. Luke Timothy Johnson’s work is richest, deepest and most scholarly of the various books about the creeds I have read. All other sources after 2003 refer to his work as foundational. It is also the only resource that focuses on the Nicene Creed more than the Apostles’ Creed. Johnson begins with more than 60 pages of background on the origins, history and importance of the creed. He provides the most detailed account of the origins of the creeds, beginning with the initial professions of faith that named Jesus as Christ, Lord, Messiah and Son of God. Johnson then offers an extensive but manageable review of the patristic letters and writings that show traces of the creed’s formation and development before explaining the dynamics of the Council of Nicea. Johnson divides the creed into six major sections, and writes extensively about each one. He begins by tracing scriptural precedents for each, then offering a theological analysis of every piece of the creed. His Roman Catholicism, traditionalism and orthodoxy shine a little to strongly for me in his outdated critiques of liberation theology, but he surprised me with his insistence that we question all-male God language and recognize all forms of the church as holy and godly. This is but one small example among many, in each section of the Johnson’s writings about the creeds, where he makes the ancient words come alive and reinforces their importance in the Christian life and faith. The Creed is valuable not only because of the depth of its history, explanation and focus in the Nicene Creed, but because Johnson constructs a beautiful, holistic theology of the Christian faith. While I may disagree from time to time, I learned an enormous amount and my heart was warmed again and again throughout his reflection on the creeds.